If you had asked me not long ago which class was going to be my first pick to level to 50 a second time, smuggler definitely wouldn't have been my answer. Not that there's anything wrong with the smuggler story, in fact I quite enjoyed it, but if I was going to repeat a class story so soon I always figured that I was going to pick one where the light and dark side choices looked like they made a big difference to the outcome... so probably agent, knight or warrior. "Want to join us, Shin?" "Um... I don't have any Republic characters below 50 anymore." So I did. Considering that this character was meant to be my dedicated low-level PvP character and in no hurry to go anywhere, I didn't pick her class based on the story, I picked it based on PvP utility, figuring that I wasn't actually going to level her to cap any time soon anyway. I just wanted an advanced class that I didn't have on Republic side yet (even if I had the mirror on Imp side perhaps), and one that was going to be fun to play in warzones. My choice soon fell on the Scoundrel, as a mirror to my Operative, but specced into dps this time so that I could have some fun blasting people in the back for a change. At first things seemed to be going well. 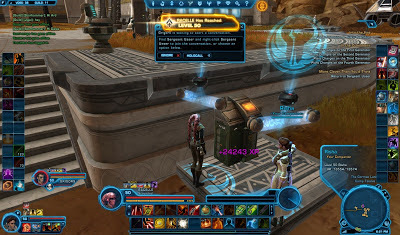 I levelled through Ord Mantell, did the Esseles, and then I started running warzones. While the lack of abilities at a really low level was somewhat annoying, I still found ways to contribute and had a lot of fun. I did my class quests on Coruscant to earn myself a couple more skills and found myself distracted for the first time as I ended up doing all the heroic missions on the planet as well. I just couldn't resist the lure of "LFM" in general chat! Oh well, I thought, even if I do some heroics in addition to my class quests, that still leaves the majority of my experience bar to be filled by PvP. Then, one day, I found myself grouping up with a guildie's gunslinger alt, I can't even recall why. 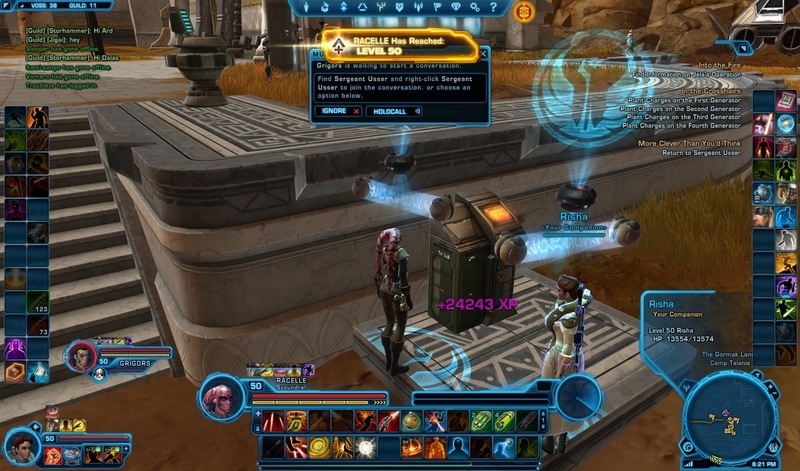 I said that I'd help him complete his last heroic on Coruscant, as I didn't mind doing it again. Then we both went to Taris, since that was going to be my next stop anyway. Before I knew it I had a load of quests in my log that I hadn't really meant to pick up... and the rest is history. Sort of. While I kept moaning about "having to" do all the quests to satisfy my guildie's OCD, I was still happy to come back for more every time. Soon I respecced to healing as well, as my twinked out gunslinger companion was killing most things before I even had a chance to run up to them, and whenever we did heroics it made more sense for me to heal anyway. In exchange he provided me with a steady stream of crafted armourings, mods and barrels for my level, and his ruthlessly efficient levelling regime made whole planets go by in no time at all, which was quite a change from my usual slow bimbling about. One of my favourite examples of this happened early on Taris, when I received a phone call and told him that I'd have to be AFK for a bit, so he asked me to put myself on /follow. When I came back, he'd completed all my quests in the entire sub-zone for me and was in the process of trying to drag me up a ledge towards a datacron. Good times. The only downside is that my "dedicated low-level PvP character" is just another one of my level 50s now... and she didn't even get to do that much PvP while levelling up either! I only just about made Gladiator rank - plus I ganked a couple of PvP-flagged Imps of my level whenever I met them out in the world while questing. I can always make another PvP alt I guess, but considering how easily I'm apparently coaxed into doing other things instead, I'm not sure how much good that will do me. why thank you (I think). and i'm not sure i would have managed to pull you up to the datacron anyways. And I agree about the datacron, but I was still impressed that you even tried. Want to help me level my Jedi Knight sometime? Who, me? Cause I'm not much help... just ask Innins.